New Diplomacy was founded to redress the lack of strategy in EU foreign policymaking, not only what the EU can do, but what it cannot do, and when it needs to encourage individual member states or other actors to take the lead. 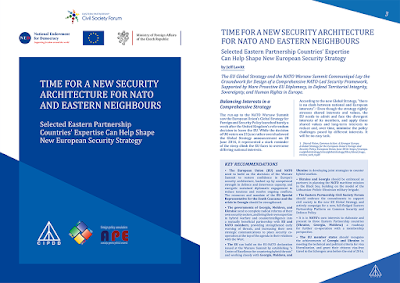 This means addressing the challenges of a common foreign policy rising above historic and immediate interests of individual EU members - from external security challenges (most acute in the case of those EU member states bordering on respectively the EU's eastern and southern neighbours, but not forgetting colonial ties in the case of others) to other priorities of individual member states, such as energy needs and long-standing trade links. We will be focusing on how the EU and its member states, and also the US - in what will be a bruising election year - should put strategy at the heart of foreign policy in 2016 by making the case that short-term interests or convenience store up problems in the long run (as if we didn't know - just look at Russia and the Middle East today), and the ramifications for the EU and US. 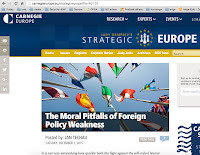 As Jan Techau sets out in a recent Carnegie Europe post, The Moral Pitfalls of Foreign Policy Weakness, it is very easy to point to the moral pitfalls of trading with the Saudis or finding common cause with Putin and Assad, but the EU and its member states needed more than soft power anyway to be a credible foreign policy player. They also needed hard power - "muscle" as Techau calls it - and too many were guilty of calling for post-Cold War defence cuts and soft-pedalling on hard economic choices needed after the recession hit in 2007. We have to work with the current climate - the diplomatic challenges, current conflicts, and current balance of hard power of course - but one thing is clear. US military capacity continues to be unsurpassed globally, and the EU is the most powerful economic bloc in the world. Strategic planning and action are needed to turn this hard and soft power into a force for stability and military deterrence also at the regional level - where global might does not currently fit the particularities of individual conflicts and potential hotspots, such as Ukraine and Syria. There is no excuse not to be putting in place mechanisms to prevent further escalation in other countries, in particular in the Middle East, the post-Soviet countries, and the Western Balkans. We will be cursing the lack of foresight if we see escalations or new/renewed conflicts flaring up in these regions when we have long known the risks - internal and external - facing all three regions.